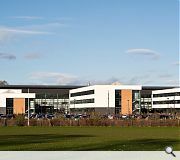 The new Auchmuty High School is part of the Fife Council’s Building Fife’s Future programme to construct a series of schools throughout the County to deliver the Curriculum for Excellence in high quality, stimulating educational environments which are the hub of the community. 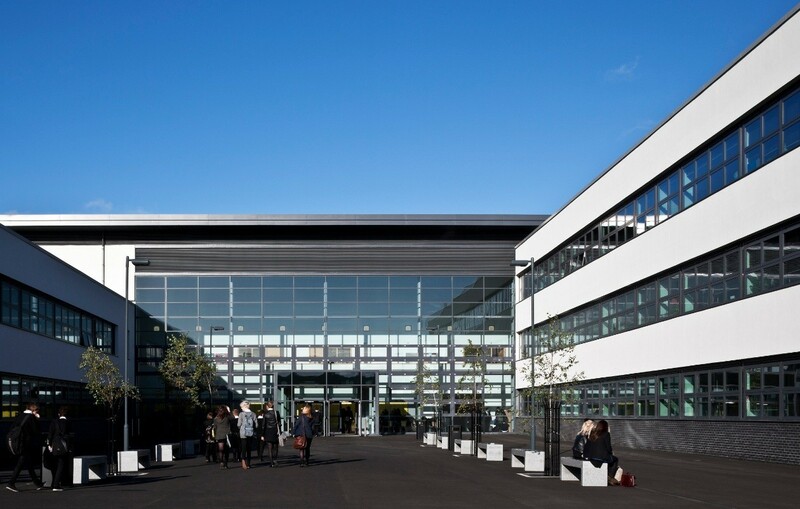 Jointly funded by the Scottish Futures Trust (2/3rd) and Fife Council (1/3rd), the new school is a replacement for the original which opened in 1957. 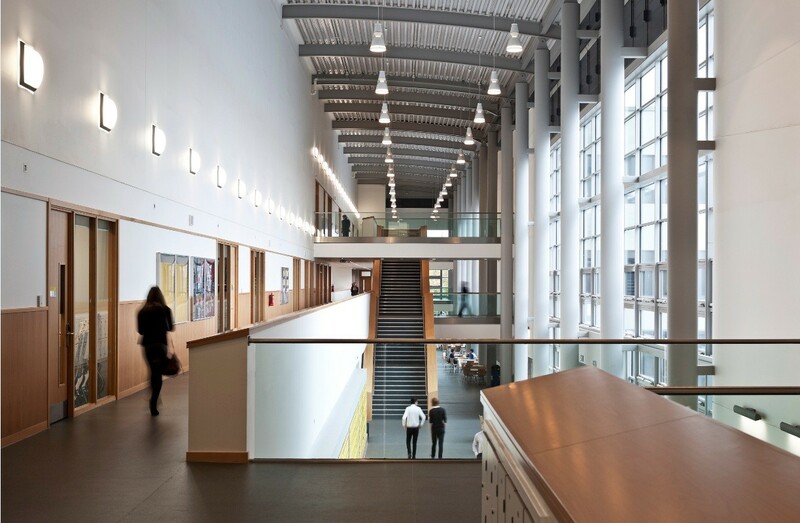 Located on a prominent site at the north east entrance to Glenrothes, the new school is a significant and successful addition to the townscape and community of Glenrothes and Markinch. The site is in a sheltered elevated space overlooking Dovecot Park to the south, with mature trees on the north and east, and good views in and out. The new school has a street and finger plan, easy to read and navigate by all users. 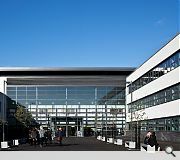 It allows flexibility in planning for the present and future; enables natural light and air to penetrate the full depth of the building; gives clear views throughout the internal and external spaces for passive policing, building management, security, student confidence and happiness. 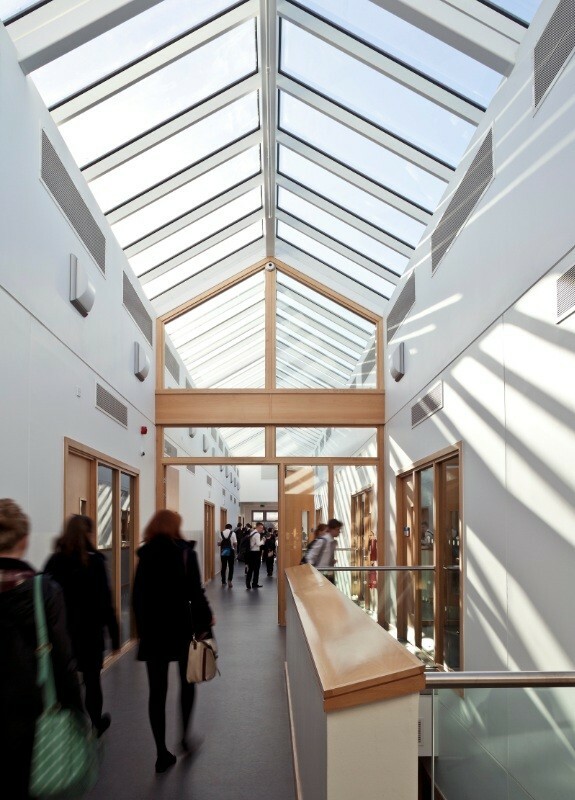 All corridors and classrooms have a “see and be seen” design with glazed screens and balustrades throughout. Designed for a minimum 60 year lifespan, a limited palette of high quality building materials, finishes and colours is used for long life and low maintenance. Plans, sections and elevations follow a rational geometry with repetition of key elements throughout. Teaching and learning takes place in areas out with Classrooms e.g. the Street and Dining Area, giving the school the ambience of a modern College. The main toilets for students and staff are located on every level at the Teaching Wings interface with the Street. WCs are in secure cubicles, washbasins are in adjacent circulation areas open to view, which deters bullying; enables passive policing by staff and students, and improves hygiene. 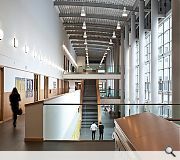 The building is designed to minimise heat loss and heat gain and maximise the use of natural light and ventilation. 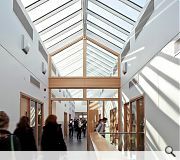 Teaching Wings have a split section with top lit circulation spine open through all floors enabling free movement of air through classrooms and circulation routes and natural light to penetrate deep into the building. Primary heating source is a biomass boiler, supplemented by gas fired boilers, solar water heating panels, and vertical axis wind turbine. Roof rainwater is recycled for wcs.